Please note that not all ebooks are available to download. For some titles, we only have licenses for 1 user to view them at a time. Titles only allowing 1 user are not available for downloading. Ebsco usually provides two options for viewing the ebooks. 1. PDF full text will allow you to view it in Adobe Reader. 2. Download This eBook (Offline) will allow you to download the full ebook to your device and access it for 7 days. See instructions for downloading on the right side of this page. Try out the new Ebsco Ebook Mobile App for iOS and Android devices. Contact the Ellis Library Reference Desk at 573-882-4581 or ask@missouri.email.libanswers.com for assistance. 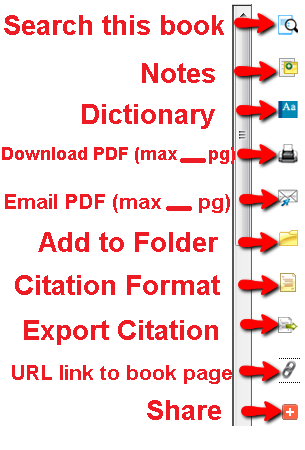 Selecting PDF Full Text gives you a variety of options, which includes reading the book while connected to the internet. You will also see the symbols below to the right-hand side of your screen. One of these options might fit your purposes better than downloading the eBook. Desktop : Adobe Digital Editions 1.7.1 or higher. To download the entire ebook, you will need the appropriate software for your device (as listed above) and an Ebsco account. Open the file below for detailed instructions. Problems Viewing Ebook in Browser? If you are prompted to download individual pages of the ebook instead of being able to view the ebook within the PDF view frame in your browser, it is likely that a setting in your browser needs to be changed to allow you to view the PDF within the browser. To the right of that entry (in the Action column), click on the down arrow and select to "Preview in Firefox." The current setting is probably to save file. Change the setting in the Action column on the right to "Preview in Firefox."